Enjoy our short list of reasons why sleep may cause dark under eye circles. To sleep or not to sleep, that is the dark under eye circle question. There is a lengthy list of reasons why some people suffer from dark under eye circles. Poor diet, seasonal allergies and genetics are just a few. One common cause is sleep. Sleep deprivation often contributes to dark under eye circles. In addition, too much sleep can be a contributing factor to dark under eye circles. Most are probably already familiar with lack of sleep as a reason for dark under eye circles. Sleep deprivation can produce dark under eye circles as well as potentially lead to more serious health conditions. Did you know that too much sleep is also linked to dark under eye circles? As we age, muscles and tissues weaken, collagen production decreases and skin starts to sag. Lying in bed, for extended periods of time, makes the veins under the eyes widen causing the darkened appearance of the delicate skin. Sleeping position can also be a factor. If you sleep on your stomach, dark circles may appear even darker as gravity pools blood under the eyes. Sleep on your back and use more than one pillow for support to help reduce under eye fluid build-up. 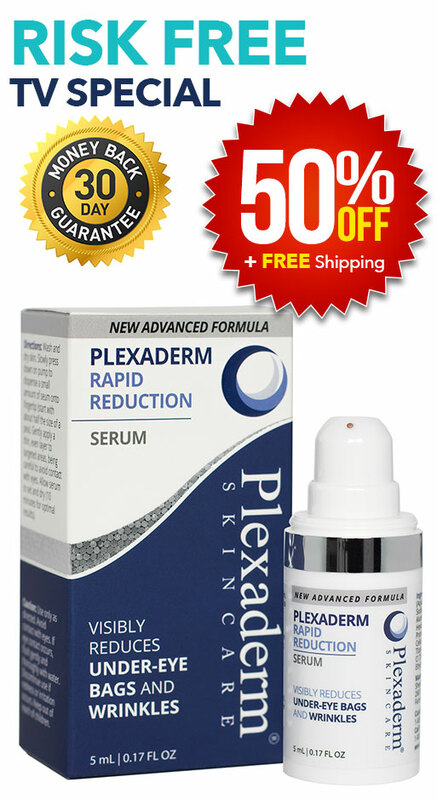 On those days that you need a little extra help with dark under eye circles, use Plexaderm. Users of Plexaderm report that their dark under eye circles look less noticeable. Plexaderm effects can be seen and minutes and can last up to eight hours Best of all, Plexaderm can be tried risk free.